1. Preheat the oven to 220˚C, gas mark 7. Mix 2 tablespoons of the yogurt with the tikka curry paste, cut 3 slashes through the chicken breasts and coat in the marinade. Place in a roasting dish and cook in the oven for 20 minutes until cooked through, with no signs of pink and juices that run clear. 2. Put the tomatoes, cucumber and salad onions, in a bowl. Toss with the lime juice and season. 3. Place the remaining yogurt in a small bowl together with the mango chutney and stir to combine. 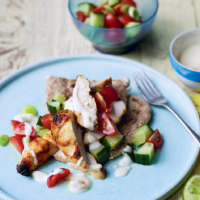 Lightly toast the pittas and serve the chicken with the tomato and cucumber salad, mango raita.